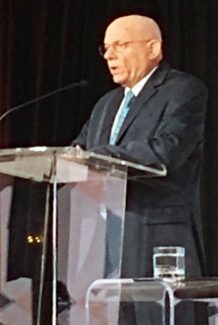 Stephen Ostroff, recently retired Food and Drug Administration deputy commissioner for food and veterinary medicine, addresses the International Dairy Foods Association’s Dairy Forum in Orlando. ORLANDO, Fla. — Two weeks after his retirement as the Food and Drug Administration's deputy commissioner for food and veterinary medicine, Stephen Ostroff let loose at the Dairy Forum here with his views on the government shutdown, the increase in foodborne illness outbreaks, prospects for the labeling of milk, and what user fees mean to the agency. The International Dairy Foods Association, which sponsors the Dairy Forum, gave Ostroff an hour to speak, twice as long as scheduled, because Agriculture Undersecretary for Marketing and Regulatory Programs Greg Ibach had to cancel due to the shutdown. "I find the shutdown to be really, really unfortunate," Ostroff said, noting that he had unexpectedly been involved in the last weeks of his tenure in making the decisions about what FDA activities would be declared essential and continue and what would not. FDA officials decided they had to continue responses to foodborne illness outbreaks, emerging food safety issues, and recalls and inspections of highest risk foods, Ostroff said. Inspections of foods produced in overseas plants were continued because those inspection visits are so hard to set up and postponing them would have been so wasteful, he added. But he also noted that the inspectors who have undertaken them are not being paid on time. "What is not happening is a long list," he said, including low-risk domestic inspection, guidance to companies, regulation writing, decisions about petitions to declare foods as "GRAS" (generally recognized as safe), development of labels and standards of identity, as well as routine communications with consumers. Ostroff said there are "no meetings, no stakeholder engagement." Work on Codex is continuing, but even if the shutdown ends soon FDA officials will be unlikely to attend meetings of international food regulators in February because there will not be time to set up their travel, he said. The shutdown is "like money going down the drain" for both the taxpayers and the industry, Ostroff explained. "We will end up having to pay everybody for work that wasn't performed," he said, noting that there are estimates that the costs of the shutdown will be greater than the cost of the Mexican border wall "that has prompted it." "This is going to cost you money," Ostroff told the dairy processing executives in the audience. "This will inevitably lead to delays and missed deadlines." "Employee morale — everyone in my office was furloughed," he said. Long term, however, Ostroff said his greatest concern is that the FDA will lose talented and skilled people and have a hard time recruiting replacements. The shutdown, Ostroff said, may be an opportunity for companies to recruit FDA personnel who are disappointed they cannot do their jobs. But he added "you need the best people at your regulatory agencies." Moving on, Ostroff said that "2018 was not a great year" for outbreaks of food-related illness. He noted the outbreaks of contaminated romaine lettuce in both Arizona and California, and said he was "amazed" that consumers resumed purchasing romaine. But he also said that the FDA's request to industry to withdraw romaine from the market and voluntarily labeling the harvest location before it could come back on the market may be a sign of the future. FDA's release of seven years of data in 2018 makes it look like the food safety problem is getting worse, he said, but the data may be a result of better reporting. Dairy, he noted, is one of the five sectors with the most cases of foodborne-illness. But he said most of those cases can be attributed to consumption of raw milk, which he said is very difficult to police. The increased marketing of raw (unpasteurized) milk and dairy products is very disturbing and industry and government should take action on the situation, he said. Technological developments, he said, are making it easier to address outbreaks of food-borne illness and also improve traceability. "Technology has swept way past anything envisioned in FSMA (the Food Safety Modernization Act)," he said. FDA is expected to finish up the FSMA regulations soon, but also faces a host of emerging issues such as whether there are food safety concerns when consumers order their food online for delivery, and whether labeling of hemp-infused foods is accurate. Consumers, he noted, want to know more about where their food comes from and where it is produced. There are also many issues with what Ostroff said he calls "synthetic foods" such as plant-based alternatives to dairy and lab-produced protein. Plant-based dairy substitutes are "a really, really complex issue," he said. The traditional standard, he said, is whether labeling is truthful. The dairy industry has objected to the labeling of plant-derived beverages as milk because FDA has a standard of identity that milk comes from a lactating animal. But Ostroff noted that FDA allowed Just Mayo to continue marketing its eggless mayonnaise after some label changes, even though FDA had previously said that mayonnaise had to contain eggs. "This has implications for use of the term milk," he said. But he also noted that FDA will be interested in why and how did consumers gravitate to plant-based products, their understanding of the products, and whether there have been adverse consequences due to the absence of calcium and vitamin D.
Asked what the food industry could learn from the way the drug industry interacts with the FDA, Ostroff noted that the drug side of the agency is not shut down because drug companies pay user fees when they submit applications for approval. Both Republican and Democratic administrations have proposed user fees for the food side, but the food industry has opposed them. Ostroff, who has served as acting commissioner of the whole FDA, said that the result is a "tale of two agencies" — the rich drug side and the poor food side. Food industry officials also complain that the process of approvals is slow, Ostroff noted. "Why do things go so slowly? You get what you pay for," he concluded.